Also serving communities of Penn Laird. There are 14 Assisted Living Facilities in the Harrisonburg area, with 5 in Harrisonburg and 9 nearby. The average cost of assisted living in Harrisonburg is $3,832 per month. This is higher than the national median of $3,346. To help you with your search, browse the 49 reviews below for assisted living facilities in Harrisonburg. On average, consumers rate assisted living in Harrisonburg 4.2 out of 5 stars. Better rated regions include Bridgewater with an average rating of 4.3 out of 5 stars. Caring.com has helped 5 families in Harrisonburg find high-quality senior care. To speak with one of our Family Advisors about assisted living options and costs in Harrisonburg, call (855) 863-8283. Harrisonburg offers a small-town feel alongside diverse arts and cultural opportunities influenced by James Madison University. Harrisburg is located in the Shenandoah Valley, right off Interstate 81 for easy access to cities such as Washington, D.C. (130 miles away) and Roanoke (110 miles away). In 2017, Forbes magazine listed Harrisonburg as a great place to retire, and the area has 26 assisted living facilities, with five in Harrisonburg for seniors looking to retire with some help. They are licensed by the Virginia Department of Social Services to ease residents' activities of daily living and must house at least four residents. The cost of living in Harrisonburg is below average. With 100 being the national average, Virginia scores 107 while Harrisonburg gets 96. Seniors looking for an affordable place in the state could do well in Harrisonburg. Harrisonburg isn’t a place with an abundance of sunny days. The city experiences just 169 sunny days yearly on average. However, it does get slightly below-average amounts of snow and rain, which can encourage seniors to venture outside more. Air quality is a concern for many seniors because excessive pollution may lead to health complications. The numbers for Harrisonburg are mixed. While it’s one of the cleanest areas in the country for 24-hour particle pollution, its annual particle numbers are not as impressive. The American Lung Association ranks it 113 out of 187 metropolitan areas, and it ranks 144 out of 227 areas for high ozone days. Seniors should follow air quality alerts and any guidelines for staying inside when necessary. The violent crime rate in Harrisonburg is 16.0 compared with the national average of 31.1, while the property crime rate is 34.6 compared with the national figure of 38.1. The relatively low crime rates may ease seniors’ minds when they venture out and about. Harrisonburg offers public bus service with discounted rates for folks 62 and older. There are also bus routes to cities such as D.C. and Blacksburg. The nearby city of Staunton has Amtrak service, and seniors can take the train from Staunton to places such as Chicago and New York City. Area attractions include the Virginia Quilt Museum, the Carrier arboretum and the art galleries at JMU and Eastern Mennonite University. Seniors and their families have much to choose from for a day out. Assisted Living costs in Harrisonburg start around $3,557 per month on average, while the nationwide average cost of assisted living is $4,000 per month, according to the latest figures from Genworth’s Cost of Care Survey. It’s important to note that assisted living rates in Harrisonburg and the surrounding suburbs can vary widely based on factors such as location, the level of care needed, apartment size and the types of amenities offered at each community. 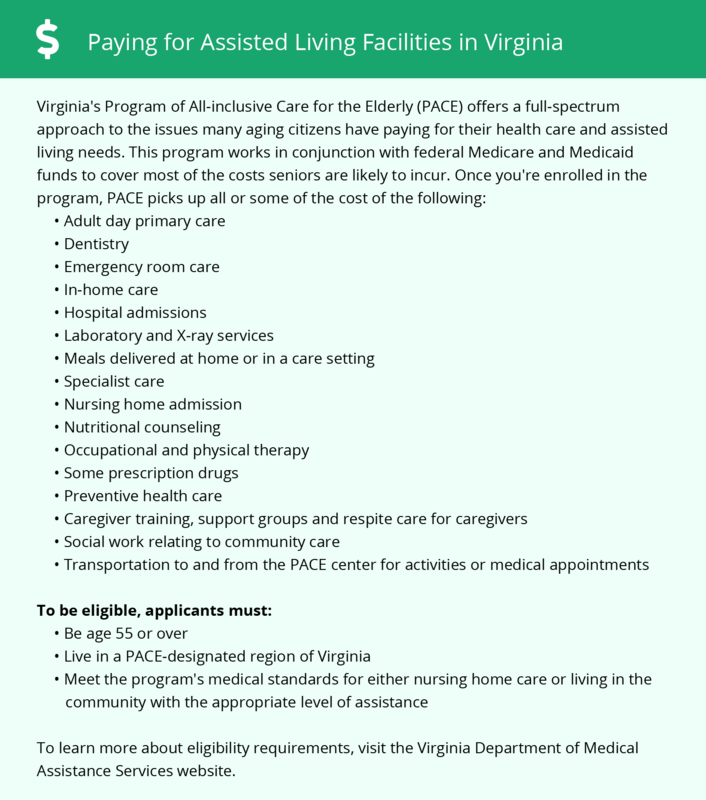 Virginia offers an optional state supplement called an auxiliary grant that qualifying Harrisonburg residents can use to defray assisted living expenses. Harrisonburg and the surrounding area are home to numerous government agencies and non-profit organizations offering help for seniors searching for or currently residing in an assisted living community. These organizations can also provide assistance in a number of other eldercare services such as geriatric care management, elder law advice, estate planning, finding home care and health and wellness programs. To see a list of free assisted living resources in Harrisonburg, please visit our Assisted Living in Virginia page. Harrisonburg-area assisted living communities must adhere to the comprehensive set of state laws and regulations that all assisted living communities in Virginia are required to follow. Visit our Assisted Living in Virginia page for more information about these laws.